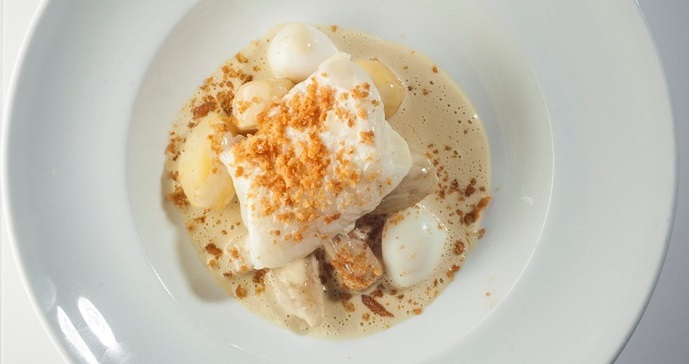 This beautiful dish contains some of the best produce that the ocean has to offer; the Norwegian Skrei. The Skrei travels several thousand miles, from the Barents Sea through icy dark waters, arriving near Norway’s beautiful Lofoten Islands; where it is caught in its prime and in perfect condition. The Skrei is growing in popularity among high end restaurants in London, and is available from January until April. Salt the SKREI® with good quality flake sea salt and leave it to stand for 20 minutes. Preheat the oven to 130 degrees Celsius. Put the SKREI® into a buttered, oven-proof dish. Bake until the fish reaches a core temperature of 45-47 degrees Celsius. Serve immediately with the freshly prepared accompaniments. Sauté the shallots and the fennel in butter in a deep saucepan, making sure not to brown them. Put the mussels into the saucepan. Stir and add the wine. Put the lid on and bring to the boil. Simmer for 5-10 minutes. Strain the mussels and the vegetables using a fine sieve and pour the broth into a saucepan. Bring the broth to the boil and add the cream. Reduce until the mixture has a creamy consistency. Open the oysters and put them and the butter in a blender. Pour in the warm creamy mussel broth and mix until you have a smooth sauce. Bring the sauce to the boil and season with salt and white pepper. Mix and foam the sauce just before you serve it with the fish and the vegetables. Heat a frying pan and melt the butter. Fry the breadcrumbs until golden brown and season with salt and pepper. Put the golden breadcrumbs on some kitchen paper to drain off the excess butter. Heat some water in a saucepan and add the pre-boiled root vegetables and potatoes. Bring to the boil and then gently simmer to warm them through, but ensure that the vegetables retain their firmness. Strain the water off and add the butter and chopped anchovies. Allow the anchovies to melt into the butter and season with salt and pepper. Gently warm the boiled eggs on a low heat in the oven or in the microwave. Serve the vegetables and eggs immediately with the fish and the sauce.